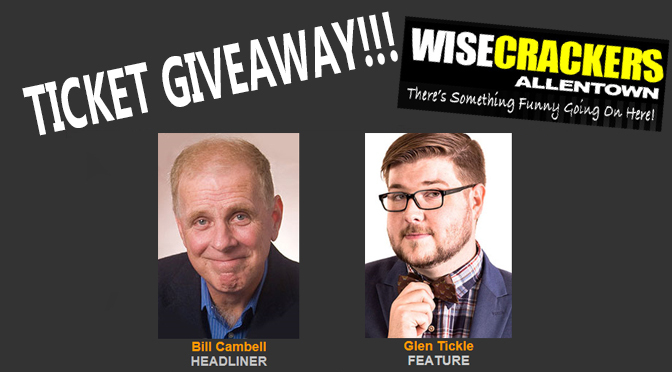 Ticket Giveaway… Don’t miss out on a hilarious weekend of comedy!!! HEADLING IS BILL CMAPBELL. Bill was voted one of Boston’s best comics. His humor on everyday life, marriage and growing up in Boston has made him one of the best. He has appeared on Comedy Central, A&E and Comedy On The Road. FEATURING IS LOCAL COMEDIAN GLEN TICKLE. Glen is a writer, comedian and ex teacher who grew up in NJ and now lives in the Lehigh Valley. He can be heard on numerous Podcasts across the Valley. Be sure to check out the awesome shows coming this Fall to Wisecrackers, including great comedians like the one and only Gilbert Gottfried!!! I need a night out desparately !! Also a good laugh or two. With all the traveling I do for work,I could use a night out seeing this great show. hi there! With all this rain a comedy show would be a break for happiness this weekend. I’d love a nice night out.